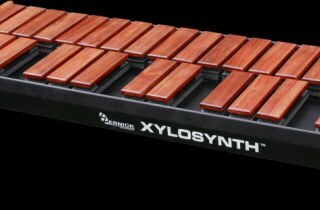 If you are looking for an alternative to your traditional marimba, vibraphone or xylophone with the capability of accessing the myriad sounds available for complete musical flexibility at home or in the workplace then the Xylosynth is for you. This BEAUTIFUL percussion instrument will make you proud to play it anywhere which is why the BBC Philharmonic and Berlin Philharmonic are amongst our prestigious owners. 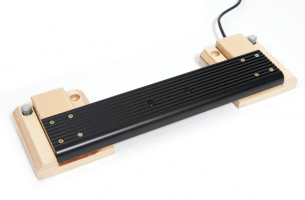 The tactile feel when striking the hard key surface combined with the dampening support system underneath to absorb the energy gives a controlled and minimal bounce, even with the hardest of mallet strikes. This bounce response is the same as playing a traditional Marimba or Vibraphone. The impact sensitive piezo sensors under each bar combined with our very sophisticated filtering technology ensures a clean rapid response. The piezos are protected by the wood bars so there is no pressure on the sensor and we can guarantee our instruments, INCLUDING bars if using soft mallets, for 2 years parts and labour. This shows the confidence we have in the build quality and robustness of our instruments. 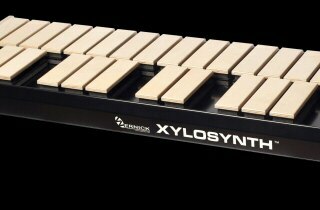 You can use the Xylosynth as an electronic marimba or electronic vibraphone but it is still a player’s instrument not a programmers. The Xylosynth is a plug in and play instrument especially if you buy our internal sounds but those players who want a more nuanced set up can delve into our fantastic onboard editing software where they will find everything they need to achieve this. 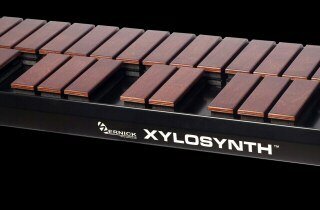 The Xylosynth is used around the world in musicals by companies such as Cameron Mackintosh, Andrew Lloyd Webber (Really Useful Group), Stage Entertainment, DreamWorks, Disneyland Paris and Shanghai and by top marching bands such as Carolina Crown, Blue Devils and The Cadets and on international tours with Cirque Du Soleil, Bjork and many others so as an owner you will be in good company! Push Button and Foot Pedal Controls on every instrument. Each instrument is custom built to specification from the many options available and we take pride in our work to ensure you receive a world class instrument and service.